Carcinoma of the bladder is the second most common malignancy of the genitourinary system after prostate cancer. 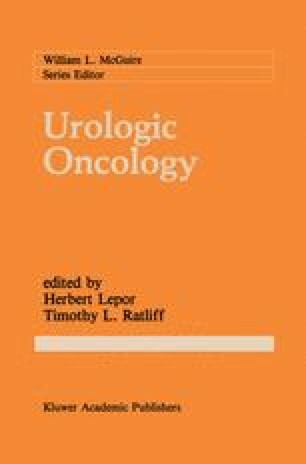 In the United States in 1988, there will be an estimated 46,000 new cases of bladder cancer and 10,400 bladder cancer-related deaths . Approximately 70% to 80% of patients with transitional cell carcinoma (TCC), the most common histologic type in the United States, will present with superficial tumors (T15, T1. These patients are effectively treated with endoscopic surgery and intravesicular chemotherapy, and have a 5-year survival of of 65% to 85% . In contrast, patients presenting with tumor invading into or through the muscle layer of the bladder wall (T2, T3, T4) have a worse prognosis. Despite radical cystectomy, with or without radiotherapy, more than half of patients will relapse with metastatic disease  and the overall 5-year survival for patients with muscle involvement ranges from 10% to 45% [3, 4]. The pathologic stage of the primary tumor correlates most closely with the frequency of regional lymph node involvement and the development of distant metastases [3, 4]. P15 and P1 carcinomas have a low probability of developing either lymph node metastasis (<5%) or distant dissemination (<10%). This incidence increases with progressive P stage such that about 40% of patients with P4 tumors will have regional lymph node involvement, and over 60% will develop distant metastasis. Supported in part by grant CA-05826 and contract CM-07337 from the National Cancer Institute, and the Charles H. Revson Foundation. Ackowledgement: We thank Drs. Alan Yagoda and Howard Scher for their review of this manuscript and their helpful comments.